Always keep track of who is located where with which vehicle. Thus, you can convey exact delivery times and spot available time-frames quickly. GDP-compliant cooling data, GPS data, and door openings are transmitted in real time. That way you can respond to deviations quickly. Tours are optimized intelligently, monitored in real time, and analysed in retrospective. All data is stored safely und in accordance to the regulations. Monday morning, 9:45am: You are checking the status of your current tours in pharma2web, when a message pops up in the Tourmonitoring which warns you that the delivery to Lion Pharmacy will be delayed. With just a few clicks you pull up the relevant tour in the Vehicle Localization and find that a traffic jam causes the delay. The target planning with its accurate time-frame forecast displays that your driver will arrive 9 minutes late in the current traffic situation. 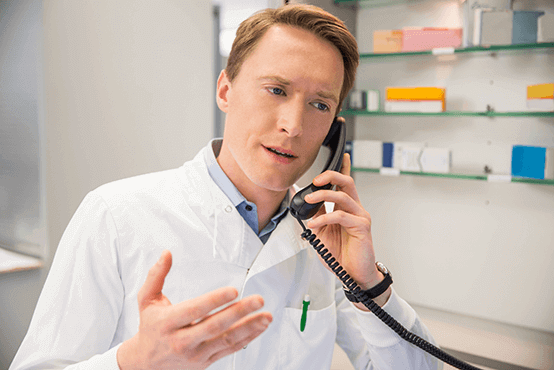 Immediately, you can relay the exact arrival time of the pharmaceuticals to your client. Despite the delay you are able to impress with precise communication. You get the information that a new building site in the city causes redirections for a significant amount of time. This affects several of your tours and increases driving time. 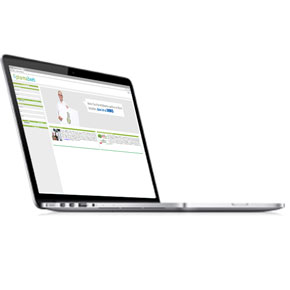 The changes in pharma2web take just a few minutes which would have cost you much more time without the software. You reschedule the tours without a problem and adjust the time and delivery frames. Afterwards, the system optimizes the tours anew. 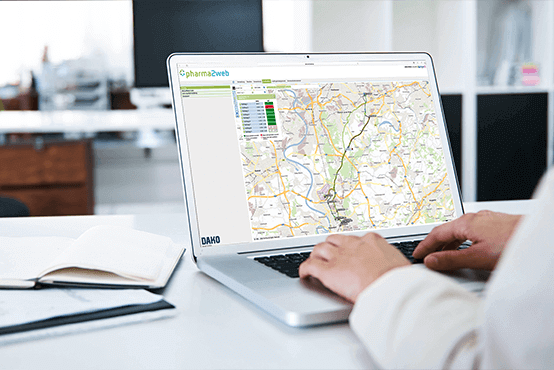 With the communications module of pharma2web you send the updated tour information directly to your driver’s navigation display. With the help of the time-frame forecast you can check if the arrival times for all pharmacies are met and correct them if necessary. 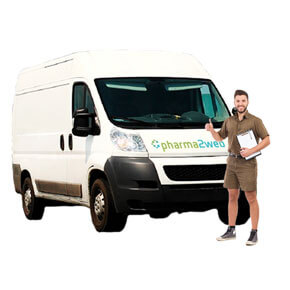 A new client, the medical laboratory “Paracelsus”, demands a GDP-compliant record for each delivery. The freight monitoring of pharma2web records temperature data from up to 6 sensors. Thus, you quickly have the respective reports at hand in digital form. 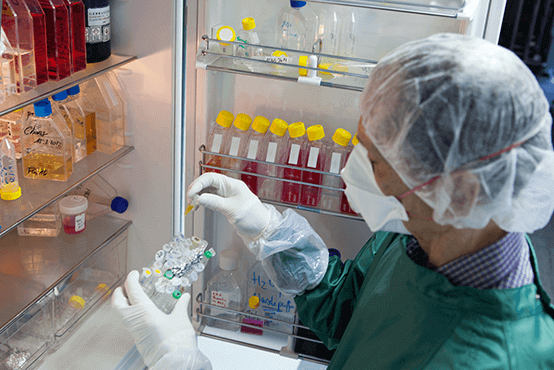 For each delivery you extract the cooling chain report and transmit the data to the laboratory. The reports include temperature data of cargo hold, transport boxes or GDP-Van, depending on the vehicle’s equipment. After one year the laboratory asks for a report from several months ago. The data is saved GDP-compliant for 5 years. Thus, you can quickly extract the document and help out your client. You are planning new orders and tours in pharma2web when you suddenly receive an alert notice. 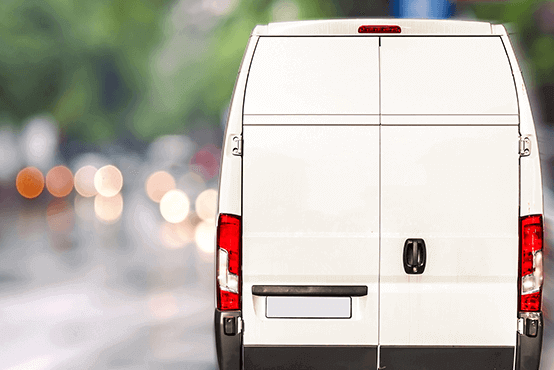 The freight monitoring of a currently driven tour warns you that the temperature in the cargo hold is rising because the vehicle door wasn’t closed properly. Immediately you contact the driver who didn’t lock the door properly at the latest stop. Fortunately, the time span of the temperature disturbance was really short, so no damages of the freight have occurred. 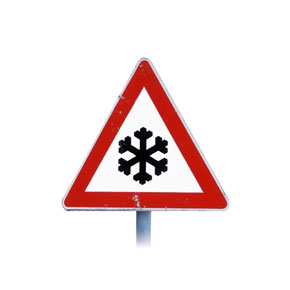 To be safe you track the temperature status for some time to rule out any more disruptions. The temperature remains constant and the sensors also report no unplanned door openings. Simply fill out the contact form at the right side of the page with an offer request for pharma2web. Alternatively, you can also speak directly with our consultants or request a call back. After a comprehensive consultation via telephone or mail we will customize an individual offer for you. After the contract conclusion a DAKO service partner will install the hardware into your vehicles. You will get your personal access data for pharma2web from your client advisor at DAKO. With immediate effect you can use the portal. The first step is to import master data of vehicles, drivers and location(s), which is made easy by the fully automatic import feature. Then address data of clients and patients are next. With the imported data you can create regular and day tours. As of now you have full access to pharma2web. At any time, we offer a product training via webinar or on site to get to know the product better (additional costs may occur). Just contact your client advisor at DAKO.